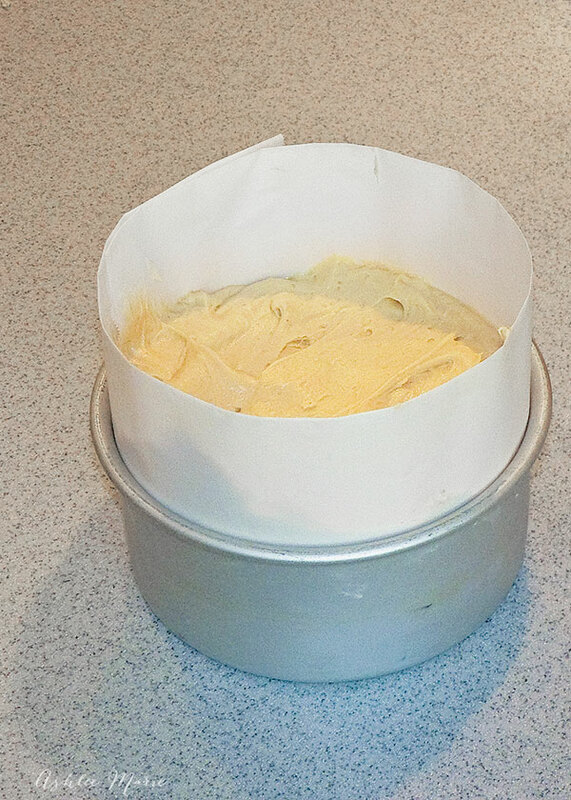 If want to bake cakes taller than the pans you have (like I do for cake carving) I also add reinforced parchment paper to the outsides. 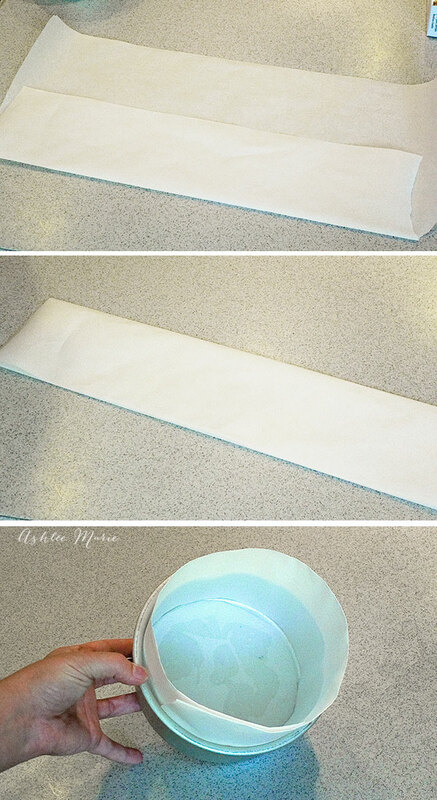 you start with pulling out a long strip of parchment paper, long enough to wrap around the cake pan. Then I fold it into thirds, fold up the bottom. Then fold down the top. To prepare it for the pan, I curl it. Then put it into the pan and let it uncurl. 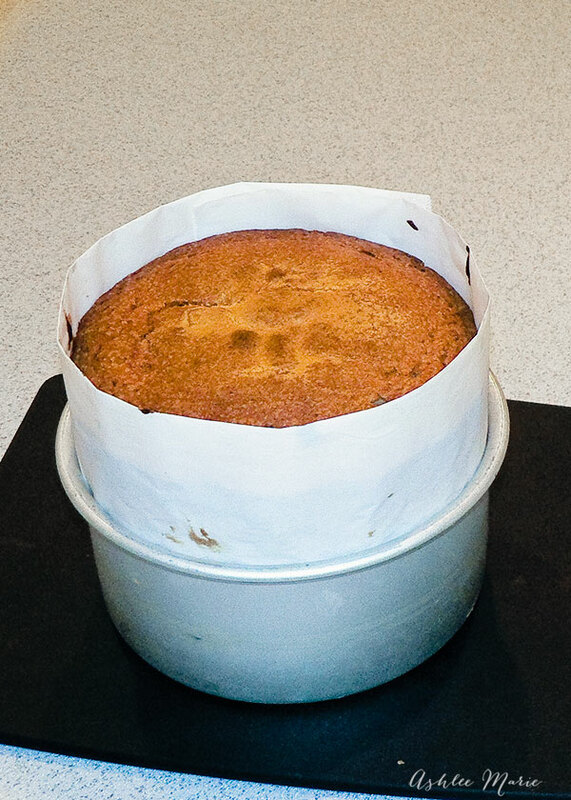 I spray a bit of PAM onto the bottom corners of the pan, it holds in the bottom circle and sides of the pan. All ready for batter! I like to pour the batter up the sides of the real pan, in this case a 3 inch tall pan. Then as it bakes it rises up taller. It’s nice for the carving I do. But you can also cut off the top and cut it into 2-4 layers, fill it and create an extra tall cake (I like my wedding cake layers to be taller, more elegant). Thank you so much for this tip! I came across your site trying to find a tutorial on topsy turvy cakes and I loved it! Thanks again! ~ Kara F.
I hope the topsy turvy cake carving is as helpful for you! How long do you bake the 6 inch rounds, since there is extra batter? ummmm thats hard to answer, I live at an EXTREMELY high altitude, so I have to do all sorts of crazy stuff to bake my cakes, so I hate to promise you one thing and have it notwork out. use bake even strips so the outside doesn’t cook too fast, and after the first 45 mins check it , if it’s still goopy add 15 mins, mine take about an hour +, but I also bake at a lower temp with extra liquid because of my altitude issues. what are bake even strips?